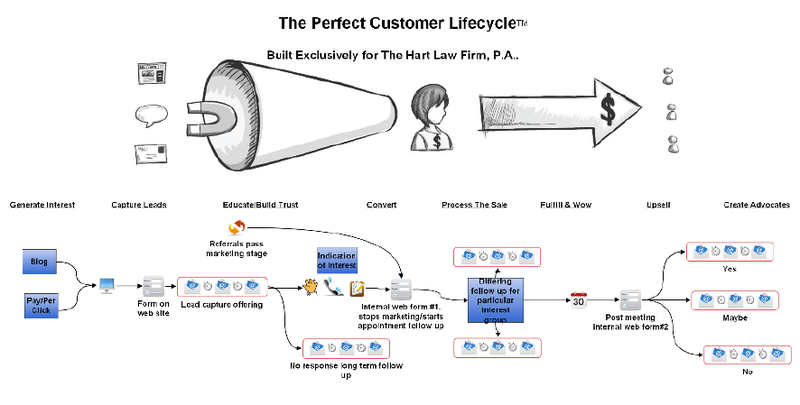 I use Infusionsoft to automate much of the sales and marketing in my law practice. It is sort of like Aweber, but on crack. Now don’t get me wrong, Aweber is a fantastic piece of software, and to create a simple email list and send out auto-responders, Aweber does the job just fine – not to mention it is extremely cost-effective at about $19 per month. But Infusionsoft is so much more than Aweber. It not only has an auto-responder feature, but it also serves as a contact and task manager. It not only automates your emails, but also automates offline mailings. It allows you to create custom web-forms that can be used to input new contacts automatically. It has a tagging feature that allows you to quickly and easily segment your list so that you are always sending information to the right person at the right time. I’ve had several people that aren’t familiar with Infusionsoft ask me how I use Infusionsoft for my law practice, so I decided to write this quick overview of why Infusionsoft is so valuable to me, and why you should consider investing in it for your law practice. 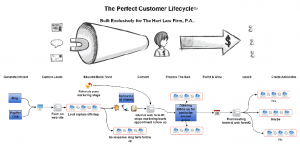 Essentially, a new lead or “prospect” goes into the large end of the funnel. Throughout the process some people opt out, some people become clients, some people do nothing. Each “contact” is always in some form of follow-up sequence. If nothing happens with them by the time they finish a given sequence, they flow through to the next sequence. Based on their behavior, my staff will switch them from one sequence to another, automatically and systematically, using the web-forms I reference above. How do new contacts get into Infusionsoft? There are 3 main ways that a contact will go into Infusionsoft. The easiest way is for them to fill out a form on my website and ask that we send them the divorce guide. They then get placed into a sequence that follows-up with them on a regular basis until they either: 1) call our office to schedule an appointment; 2) do nothing and the sequence runs its course. Other people do not fill out a web-form, but just call our office looking for information. In this case, my paralegal will use a web-form to capture this information, the requested information automatically gets sent to them, and then they get placed into the same sequence as above. If people call the office to schedule an appointment, the original follow-up sequence they were in is automatically stopped, and they are placed into a new follow-up sequence that sends them information they need to prepare for their first meeting at my office, including an agenda, directions, a questionnaire to fill out and bring with them, etc. They also receive an email reminder the day before the meeting. All of this happens automatically, without any additional work on the part of my paralegal or me. A third way that prospects and possible referral sources get entered into the system is through a handy little app they have created called “Snap”. The app allows you to take a picture of someone’s business card, the card gets processed (by a human or really smart computer, because they don’t make mistakes), and then you can review the information that they pull out of the card, tag the contact, and add them to Infusionsoft and as a contact on your phone. This is a great feature if you go to a conference, networking event, or hold a seminar for potential new clients. When you get back to your office with a stack of business cards, instead of manually entering all that information (or having your assistant do it – we know how much they love that…), you can just take a couple of minutes and snap a picture of each card into Infusionsoft. It’s like magic. So what to do with the contacts now that they are in the system? This is where Infusionsoft really shines. With most email auto-responder programs, the only thing you can do with a contact that optins to your list is add them to an email follow-up sequence, set them up for blog updates, or send them a broadcast message (which is sent to your entire list). With Infusionsoft, however, different messages and follow-up sequences are sent to the prospect at different points in the sales cycle. 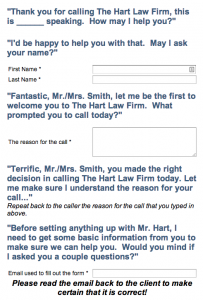 So for example, when someone signs up for my divorce guide through a web-form on my law firm’s website, they are put into a follow-up sequence that sends them additional information about divorce in North Carolina and the services that my firm can offer. If they never call to schedule an appointment, then at some point the initial follow-up sequence ends, and they are put into a longer term “nurture” sequence which sends them information about once a month. However, if they do call to set up an appointment, they are taken out of the initial follow-up sequence and sent a series of messages that prepares them for the initial meeting with my office. Assuming they become a client, they are then placed into a different sequence, and both myself and my paralegal are provided a number of tasks that we must complete based on the type of case that it is. Different sequences are used for different cases and types of clients, and this process continues until the matter is completed, at which point they are dropped back into the long-term nurture sequence that I referenced above. In addition, each contact is placed into a “birthday follow-up” sequence that reminds both me and my paralegal to send out a birthday card to the contact each year. 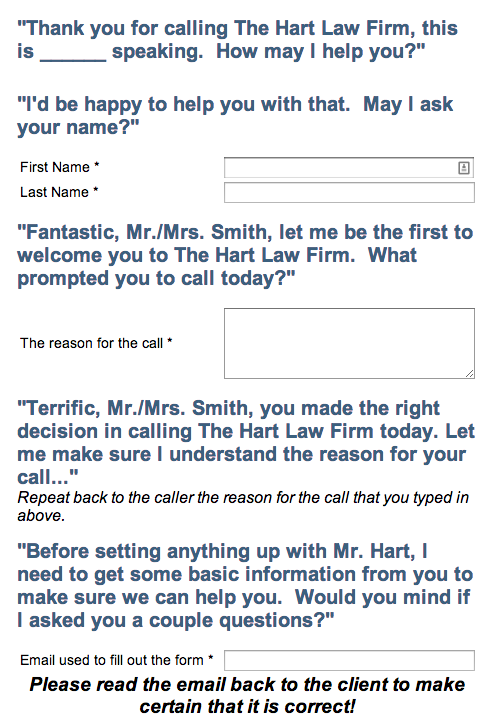 What’s really important to understand is that all of this is done automatically through the use of web-forms. Is Infusionsoft right for your practice? Honestly? I don’t know. At about $200 per month for the base level (up to 5k contacts) Infusionsoft is more expensive than other auto-responder programs. But if you are comparing Infusionsoft to Aweber, for example, it isn’t really a fair comparison. There aren’t many programs out there that do what Infusionsoft does. Salesforce might be the most similar, but I’ve never used that program and can’t comment on its merit. I do know that at this price point, if Infusionsoft saves me one hour of time per month (which it easily does), then it is a good investment for me personally. In addition, because of the numerous ways that I can customize different follow-up sequences for different contacts, I probably attract clients that I wouldn’t have otherwise been able to follow-up with. So from that standpoint, Infusionsoft easily pays for itself with new business for my firm. If you want to watch an example of how another attorney is using Infusionsoft in his practice, please click here to watch a video about David Hirsekorn and how he uses Infusionsoft to automate the sales and marketing efforts for his estate planning practice. Want to learn more about how I use Infusionsoft in my practice? Feel free to reach out to me through the contact us page at the top of the website, or post a comment below. I love talking about marketing, and would love to help you take your law practice to the next level.